For a decade Chloe Sullivan played one of Supermans best friends in the TV show. She quickly became one of the shows most solid characters and helped the Blur become Superman. For the new generation of Superman fans she is one of the biggest influences on his time in Smallville. There have been rumors recently that Chloe Sullivan may be coming to the comics in the near future but it appears she may also have a part in the new Superman movie too. Pictures of the not so closed set have revealed many surprised for fans but nobody could have guessed we would see the Sullivan family business in the background. 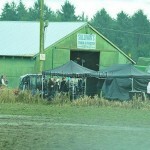 This could be a good sign for Chloe fans as so much of the film is being filmed in the farm town that it’s almost guaranteed we will see her have a part or at least a small cameo in the 2013 movie. This picture was one of many which surfaced recently including the first picture of Kevin Costner as Jonathan Kent.